There are 172 active	users right now. Use of SUSIBA2 rice in reducing the methane emissions from the paddies may turn into more substantial with the global warming. Increased temperatures quicken methane emissions in all ecosystems including paddies, but they also favour SUSIBA2-derived carbon apportionment to the seeds and aboveground biomass, thus responding the temperature-driven acceleration of rice paddy metha.. The growing populations of worlds facing the problem of constant string of tradeoffs. On the one hand, to feed ourselves needs more rice. And also, control of greenhouse gases is a One of important aspect and rice growing produce a huge amount of methane. Rice feeds over half the people on Earth and, is the world's second most valuable and third largest crop. The SUSIBA2 compared with a control strain trouble is that rice paddies with warm and wet soils, harbor colonies of the microbes that feed off the carbon dioxide dissolved in the mud and convert it to methane. Such paddies are one of the important sources of atmospheric methane, accounting for more than 17 percent of global emissions. This is significant because methane traps 20 times more heat than carbon dioxide. The thing is to famish the microbes of carbon dioxide by diverting it out of the paddy and into the plants. Normally, during photosynthesis process, carbon dioxide is converted in sugar and starch. Directing more carbon dioxide to the rice grains makes them enviable and more nutritious, and concentrating it to the stems and leaves creates more biomass for fuel and livestock feed. SUgar Signaling in BArley 2 (SUSIBA2) is a new genetically modified rice strain that is the result of over 10 years of work including scientists from the US, Sweden, and China, and 3 years of Chinese field studies. Giving to the team, it kills two birds with one stone, so its rice paddies emit almost no methane during growth while producing more starch and biomass that can be used for fuel and feed. The strain was created by the insertion of a single gene from barley to rice. This main regulator gene produces several other genes and causes the rice plant to dissuade more carbon to its grains, leaves, and stems as occurs in barley. This starves the microbes in the rice paddy soils around the rice plant roots, which usually generate methane while increasing crop yields. High-starch content and low-methane emissions are two main traits in rice breeding that are challenging to achieve at the same time. In 2002, high-yielding rice cultivars with improved productivity were offered as a strategy for decreasing methane emissions. However, no such high-starch low-methane-emission rice has as so far been reported. Here we report the first example, of such a rice, SUSIBA2 rice, created through transcription factor technology. Sugar signaling in barley 2 (SUSIBA2) is a plant specific transcription factor that regulates sugar-inducible gene expression, in that way mediating source-sink communication. Increasing expression of SUSIBA2 is related with an increase in sink strength and starch biosynthesis. They postulated that the overexpression of SUSIBA2 in the seeds and stems of rice would increase sink strength in aboveground tissues and produce a high-starch low-methane-emission rice variety. They have suggested a model (fig. 1) for how the SUSIBA2 rice works. The HvSBEIIb promoter activity is sugar-inducible via encouragement of HvSUSIBA2. When photosynthates (sugars) are available, HvSBEIIb p: HvSUSIBA2 augments sugar-inducible activities of targeted genes, including the HvSBEIIbp construct. The augmented gene expression increases the sink strength in tissues where HvSUSIBA2 is expressed. The improved sink strength pulls more sugars from source tissues to yield more biomass and more filled grains related with greater the starch content. 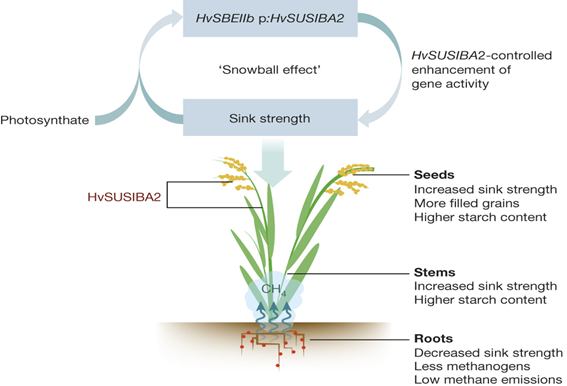 The augmented allocation of the photosynthates further activates HvSBEIIb p: HvSUSIBA2, initiating a 'snowball effect' for increasing sink strength. Snowball effect was demonstrated by the exogenous sugar treatment of leaves and field trial experiments. The expression levels of sugar-inducible genes were suggestively higher in SUSIBA2 rice than in Nipp when the sucrose was available. The methane emission lessening was more effective during summer than during autumn, and at the noon than in morning or later afternoon. The data showed that the higher temperature and enhanced sugar metabolism during summer and at the noonday may favour the SUSIBA2-derived snowball influence and carbon allocation to the aboveground biomass. Fig 1 |The model showing the high-starch and low-methane-emission SUSIBA2 rice. Sugar-inducible HvSUSIBA2 expression creates a snowball effect that eventually leads to a rice plant with improved starch accumulation in seeds and stems and reduced carbon allocation to roots, which reduces the methanogenic growth and the methane emissions. Red dots represent the methanogens. As advised in the model, low sugar availability in SUSIBA2 rice roots results in a rhizosphere with a lesser amount of organic biomass and hence less root exudates as nutrients for inhabiting the methanogenic consortia. As a consequence, methane emissions declined. Due to the biomass differences between SUSIBA2 rice and Nipp, we do not exclude the opportunity that the emission decrease is due in part to impair the methane transport in the SUSIBA2 rice. 1. Su, J. et al (2015). Expression of barley SUSIBA2 transcription factor yields high-starch low-methane rice. Nature, 523. doi:10.1038/nature14673. 2. Qiu, J. (2009). China cuts methane emissions from rice fields. Nature. http:// www.nature.com/news/2009/090818/full/news.2009.833.html. I am currently pursuing PhD in Genetics and plant breeding from University of Indian Agricultural Research Institute, New Delhi. PhD Scholar, Division of Environmental Sciences. 3rd year environmental science student at Indian Agricultural Research Institute. Ph.D. Scholar (Genetics and Plant Breeding) at Junagadh Agricultural University, Junagadh. Surgery, Radiotherapy and Chemotherapy Followed by Tumor Immunotherapy?